Get free cranberries at Target when you stack these 2 Ocean Spray Cranberries. This is super easy to snag! Here’s how to get the Free Cranberries At Target. Final Price: FREE using both coupons! Have you found any great deals to share with us? Post your comments and share your shopping deals & success! My fav, fresh produce coupons!! 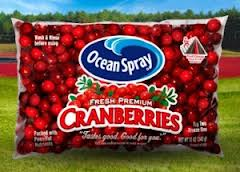 A very unusual Ocean Spray Cranberries coupon is available. Print it now so you will have your fresh cranberries for the season. 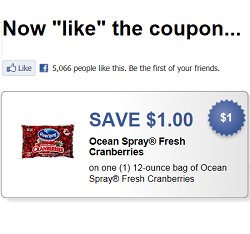 Ocean Spray has a high value coupon out for Ocean Spray Blueberry. CVS and Stater Bros has Ocean Spray Juice on sale for $2.50. Use this coupon to get it for $1.50. Remember you can print 2 per computer! Search the Free Coupon Database for more great juice coupons. Coupons are crazy good today! Get the new B1G1 FREE Ocean Spray Coupon. Print now & hold! CVS will be having a B1G1FREE sale starting 5/20. Per CVS Coupon Policy they accept B1G1Free coupons on a B1G1FREE sale. So you will get 2 FREE per coupon!!! See more great CVS Deals this week too! 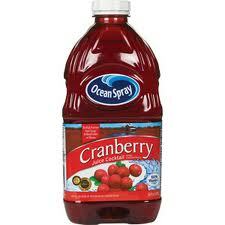 Ocean Spray Juice- 2 FREE at CVS!! Coupon is gone, but sale is still on and 1/2 price isn’t bad! CVS has on sale this week 3/11-17 — Buy one get one FREE Ocean Spray sale. Using the BOGO Ocean Spray coupon BOTH will be FREE!! 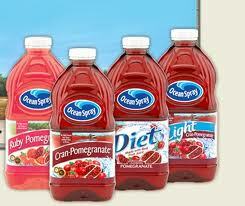 Print this Buy one get one FREE Ocean Spray! Then head to CVS before the shelves empty out! See the other great deals at CVS this week. CVS Store Deals.